Chicago Review Press, 9781613736098, 272pp. “My dear Uncle Charles,” twenty-two-year-old Genevieve de Gaulle wrote on May 6, 1943. “Maybe you have already heard about the different events affecting the family.” The general’s brother Pierre had been taken by the Gestapo; his brother Xavier, Genevieve’s father, had escaped to Switzerland. Genevieve asked her uncle where she could be most useful—France? England? A French territory? When no response came immediately, she decided to stay in France to help carry out his call to resist the Nazis. 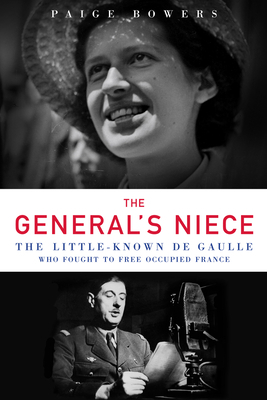 Based on interviews with family members, former associates, prominent historians, and never-before-seen papers written by Genevieve de Gaulle, The General’s Niece is the first English-language biography of Charles de Gaulle’s niece, confidante, and daughter figure, Genevieve, to whom the legendary French general and president dedicated his war memoirs. Journalist Paige Bowers leads readers through the remarkable life of this young woman who risked death to become one of the most devoted foot soldiers of the French resistance. Beginning with small acts of defiance such as tearing down swastikas and pro-Vichy posters, she eventually ferried arms and false letters of transit to fellow resistants and edited and distributed the nation’s largest underground newspaper, until she was arrested and sent to the infamous Ravensbuck concentration camp. The General’s Niece reveals the horrors the young de Gaulle witnessed and endured there that could have broken her spirit but instead inspired her many remaining years of activism on behalf of former prisoners and of France’s neediest citizens. Finally emerging from the shadow of her famous uncle, the life of this little-known de Gaulle adds a fascinating layer to the history of the second world war, including the French resistance, the horrors of and unshakeable bonds formed at Ravensbruck, and the issues facing postwar France and its leaders. Paige Bowers is a news and features writer whose work has appeared in TIME, USA Today, the Wall Street Journal, the New York Times, People, the Atlanta Journal-Constitution, Atlanta Magazine, and others. A lifelong Francophile, she earned a master’s degree in modern European history in 2012 and teaches continuing education classes at Louisiana State University about French history and culture. She lives in Baton Rouge, Louisiana.